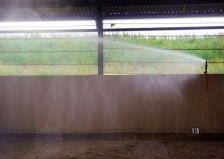 The ProRide irrigation system is designed for any 20m wide indoor or outdoor menage for the prevention of dust and to maintain a consistent riding surface. Sprinklers located around the perimeter of the surface, either above the kick boards, on an indoor surface, or on the posts and rails on an outdoor arena, operate in sequence in groups for a pre-selected time period. 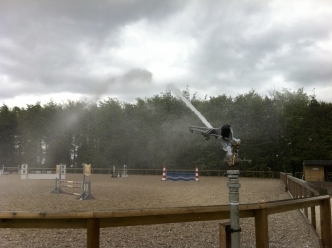 These sprinklers can be startedmanually or programmed to start automatically prior to the school being used. 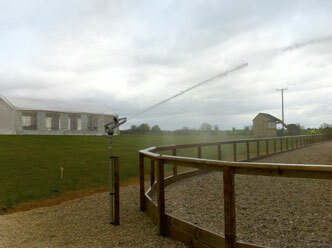 The sprinklers can be programmed for different amounts of running time if required for differing weather conditions. The secret is to firstly create the optimum damp conditions to combat the dust whilst not over watering, then to top up as and when required. The ProRide system from buyirrigation.co.uk system gives you the ability to do this. 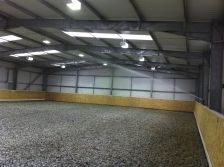 ...everything required to install the system including pipework, sprinklers, valves and control equipment together with a small pump and 2500 litre plastic tank. Self installation will take approximately 50 man hours. Once installed, simply connect a water supply into the tank plug the pump and controller into a standard mains plug socket and you are away. The system can also be supplied for you to purchase your own tank...your choice!